CWS has launched an appeal for the many people affected by Super Typhoon Haiyan. Donations will help in the immediate relief effort and long term recovery. Hundreds and thousands of people are now homeless and many traumatised by the viciousness of the storm. They will need food, water, clothing, shelter, medical care and help cleaning up debris. The typhoon-affected areas include communities experiencing high levels of poverty, and hard hit areas are still extremely difficult to reach due to flash floods, landslides, fallen trees, damaged roads, downed power lines and telecommunications. Working with local partner organisations the immediate need is to provide food, shelter repair. CWS is working with local partner organisations to find out what they need most. 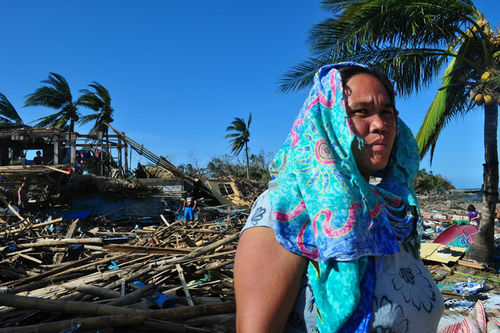 The National Council of Churches in the Philippines and other members of the ACT (Action by Churches Together) Alliance have begun on the ground assessments in Leyte, Panay and Samar, and are preparing to launch major relief efforts. CWS is still waiting to hear from the Developers Foundation in Aklan province and other groups in northern Mindanao. Communications difficulties are making the task of relief extremely difficult. Heavy rain predicted in the next few days will slow response efforts. An estimated 9.5 million people have been affected across nine regions and almost 620,000 people displaced according to the UN’s Office for the Coordination of Humanitarian Affairs (OCHA). “Our thoughts and prayers are with all Filipinos. We are amazed at the number of people that have survived the shock and trauma of the typhoon. We extend our sympathy to Filipinos in New Zealand who have lost loved ones and who are awaiting news of their family,” she adds. The super typhoon Haiyan, locally known as Yolanda, made landfall in the Philippines Eastern Visayas Region in the early morning of 8 November, hitting an area still recovering from the 7.2 magnitude earthquake. CWS has been supported by NZ churches for 68 years. It is a member of the ACT Alliance (Action by Churches Together) consists of more than 130 national churches and groups working in 140 countries for humanitarian assistance and development. ACT helps where needed regardless of race, religion or region.